Global shipping traffic is awful. 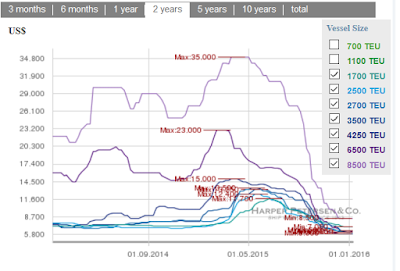 Worse yet, US rail traffic is downright recessionary looking. Bloomberg reports Rail Traffic Is Saying Something Worrying About the U.S. Economy. 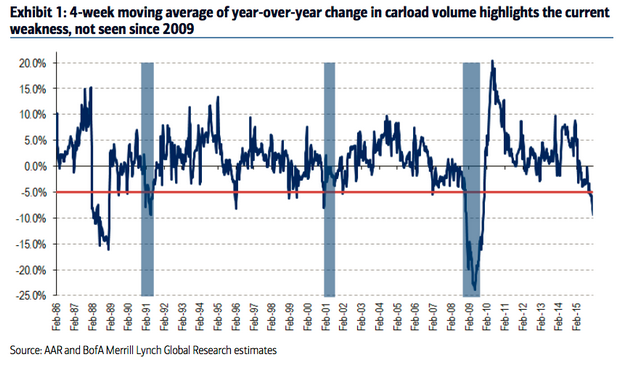 It's not the jobs report or the latest housing data but railway cargo that has analysts at Bank of America concerned. Railroad cargo in the U.S. dropped the most in six years in 2015, and things aren't looking good for the new year. "We believe rail data may be signaling a warning for the broader economy," the recent note from Bank of America says. 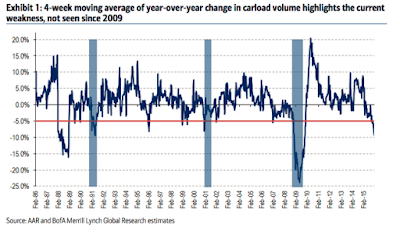 "Carloads have declined more than 5 percent in each of the past 11 weeks on a year-over-year basis. While one-off volume declines occur occasionally, they are generally followed by a recovery shortly thereafter. The current period of substantial and sustained weakness, including last week’s -10.1 percent decline, has not occurred since 2009." BofA analysts led by Ken Hoexter look at the past 30 years to see what this type of steep decline usually means for the U.S. economy. What they found wasn't particularly encouraging: All such drops in rail carloads preceded, or were accompanied by, an economic slowdown (Note: They excluded 1996 due to an extremely harsh winter). "Similar periods of weakness have occurred in only five other instances since 1985: (1) the majority of 1988, (2) the first half of 1991, (3) several weeks in early 1996, (4) late 2000 and early 2001, and (5) late 2008 and the majority of 2009 … all either overlapped with a recession, or preceded a recession by a few quarters." Please consider Investigating Claims "North Atlantic Trade Ground to a Halt, No Ships Moving"; The Real Shipping Story. Here's an eye-opening chart from that report. Mining and commodities are no doubt "part" of the decline, but please don't tell me this is all commodity related. And don't tell me that the decline in shipping is all China related. Above all, don't tell me manufacturing does not matter or the US economy has decoupled from the world. For details on the awful state of shipping, please see Investigating Claims "North Atlantic Trade Ground to a Halt, No Ships Moving"; The Real Shipping Story. The idea that China would decouple from the global markets in 2007 was ridiculous. Reverse decoupling, the notion the US will decouple from the global economy is equally ridiculous. Finally, the new found theory that "manufacturing no longer matters" and the US service economy will carry the day alone is the most ridiculous decoupling thesis yet.